A collection of specially commissioned essays, this volume surveys the work of the 17th-century philosopher-scientist commonly regarded as the founder of modern philosophy, while integrating unique essays detailing the context and impact of his work. 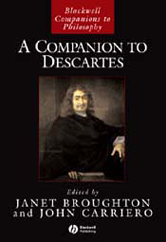 Covers the full range of historical and philosophical perspectives on the work of Descartes. - Discusses his seminal contributions to our understanding of skepticism, mind-body dualism, self-knowledge, innate ideas, substance, causality, God, and the nature of animals. - Explores the philosophical significance of his contributions to mathematics and science. - Concludes with a section on the impact of Descartes's work on subsequent philosophers.